This book was a little different than the books that I usually pick up. I like different so I was eager to give this one a try. I found that I enjoyed this book the most when I read just a little bit at a time so I spent over a month with this one working it around other books. It was a book that I found fairly easy to set aside but I always seemed to circle back to it before long. While I didn't love the book, I did like it and am glad that I decided to give it a try. I knew that this was a book about trees before I started reading and it was. Kind of. Trees do play a very large role in the story but I really saw this as a book about people. The book was told through the stories of several people whose lives were shaped or touched by the trees and nature around them. Each of the characters had a unique and special relationship with the world around them and I was inspired by the measures that they took to protect their world. The book initially reads like a collection of short stories. We meet each of the characters in their younger years, usually as either children or teens, and see how trees have impacted their lives. Then the book shifts gears and the lives of these characters start to converge and they start to have an impact on each other. As the book drew closer to the end, the characters untangled themselves from each other and went back to a separate existence. I enjoyed each of the characters' stories but the strongest part of the book for me was when the majority of the characters were together worked towards a shared cause. I really felt their passion as they worked to save the trees and the environment as a whole. The book lost a lot of momentum for me as it drew to a close. I found that the characters were not nearly as interesting apart as they had been together and the story became quite depressing. I did find the writing to be quite beautiful. The descriptions used really brought nature to life and made me want to see it preserved. I felt the impact of its destruction and understood why the characters were willing to sacrifice so much to protect what they could. I do think that this book could have been trimmed a bit. It did feel overly long at times. There was one character that had a story that was really very separate from the other characters and could have been completely omitted in my opinion. I am glad that I read this book. It made me really think about our environment and the impact of our behaviors on the world around us. 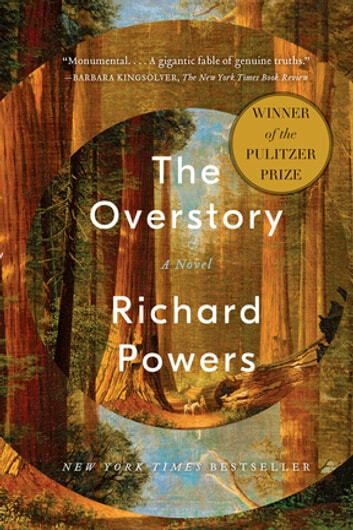 I wouldn't hesitate to read more from Richard Powers in the future. I received a copy of this book from W.W. Norton. There is really no book like this, of its reach, of its perspective. It will change your view everytime you are, or look outside. This book is one of those that take your breath away, with the writing, with the characters, with the ideas. It makes you be in awe of trees, of how majestic they are.